What an afternoon of amazement and awe. So many abbreviated words and initials that mean so much more, but look like elements or cryptic codes of a secret society. It began with my wife Peggy. She and friends from her P.E.O. Chapter AY sisterhood group were interviewing young women for a chance at a PEO scholarship. One of the candidates talked about her dream of being an engineer. She was a member of SOTABots. SOTABots showed their colors by wearing bright yellow T-shirts and Club #2557. “FIRST (For Inspiration and Recognition of Science and Technology) was founded in 1989 to inspire young people’s interest and participation in science and technology. Based in Manchester, NH, the 501(c)(3) not-for-profit public charity designs accessible, innovative programs that motivate young people to pursue education and career opportunities in science, technology, engineering, and math, while building self-confidence, knowledge, and life skills. “The United States has developed as a global leader, in large part, through the genius and hard work of its scientists, engineers, and innovators. In a world that’s becoming increasingly complex, where success is driven not only by what you know, but by what you can do with what you know, it’s more important than ever for our youth to be equipped with the knowledge and skills to solve tough problems, gather and evaluate evidence, and make sense of information. These are the types of skills that students learn by studying science, technology, engineering, and math—subjects collectively known as STEM. When the competition began, robots began working amassing points on a scale beyond my comprehension. What is the progression of FIRST? Teams of middle and high school-aged students are challenged to design, build, and program a robot to play a floor game against other teams’ creations. What does STEM and FIRST have to do with real life? I like the connection that Dr. Leigh Nathan, a FIRST Alumna from Connecticut has to say about her participation and inspiration. “I’m a psychiatrist and a proud product of FIRST. I participated in FIRST in high school and mentored in college at Northeastern University. FIRST was a prominent factor in my choice of college and major, as well as my decision to study medicine. 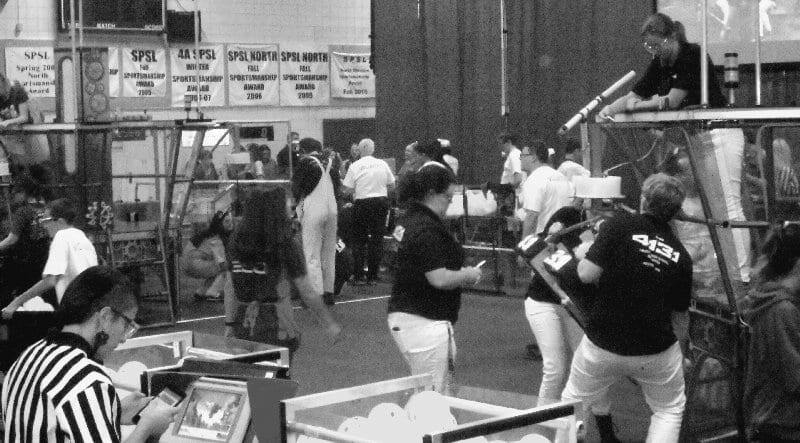 In the middle of the seriousness there was a stuffed dog strapped onto the mechanisms of a competitive robot. I recognize the juxtaposition of fun, games, creativity . . . and learning. As we approached Maple View Middle School, we could see cars parked all long the road. In the parking lot, many of the cars had trailers like you would see in the old days with a “funny car” or “dragster” inside them. We walked across campus and aimed for the gymnasium. Everything was in a flux of managed chaos. People walked around with dozens of pizza boxes to supply their teams. Duct tape was everywhere holding up signs. A double door divided robots and spectators. Eventually we were herded into a hallway and then back into the gym where every seat was taken on the bleachers. The bleachers faced a bustling center court of referees, camera people, team members and I don’t know how many others preparing for the next competition between teams of robots. When the competition began, robots began working amassing points on a scale beyond my comprehension. I wandered away in the direction where we had entered. I followed carts, each loaded with a robot needing adjusting, or sometimes complete repair. Lifting these robots is at least a two person job . . . more like three people. This event was a long way from Robot Wars, but crashes, bumps, confrontations, mishaps and collisions happen during the event. I found another area with a stage and work area or “pit” for each team to work on their “bots.” Team members chatted with themselves or tweaked gears and settings. 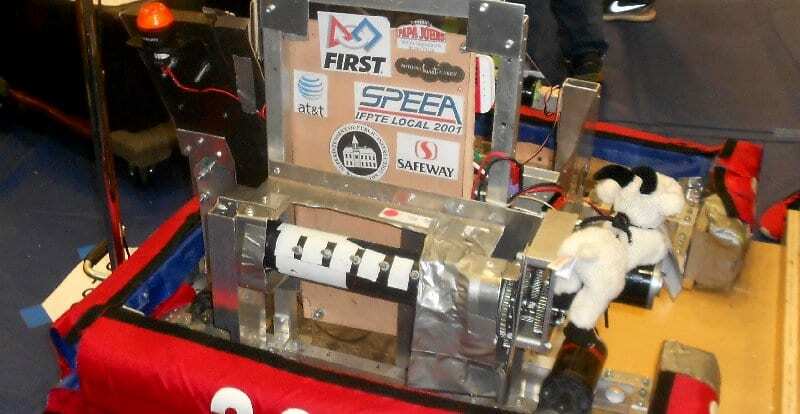 Most bots had stickers from sponsors. I was proud to see a SPEEA sticker. SPEEA is the union that deals with engineers and other professionals and their contract relationships with Boeing. We’ve done videos for them in the past to help with negotiations. No one was unruly. I saw fake robots, hand puppets, and lots of smiles. It was a mixture of Middle Earth and girls’ bedrooms. Some people wore capes, some wore tu tus . . . some guys wore wigs, and everyone seemed to be engrossed in what they were doing . . . and on top of the world. And yet, in the middle of the seriousness there was a stuffed dog strapped onto the mechanisms of a competitive robot. I recognize the juxtaposition of fun, games, creativity . . . and learning. Nice article. I enjoyed reading it. Addie sent me the link. I hope you keep following this group. It would be rewarding to hear more and follow up with the teams progress.